This is a line of products whose main feature is the possibility of consuming them directly, either on their own or mixed with other ingredients and preparations. 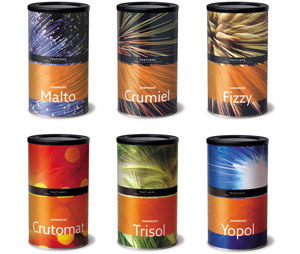 They are products with different characteristics from one to the other but with one common denominator ‐ their special texture, individual and unique to each of them. Effervescent in the case of Fizzy, light in Malto and Yopol, and crunchy in Crumiel, Trisol and Crutomat. Flavours and textures that can represent a fantastic, surprising solution to the finish of recipes both sweet and savoury.